HIT me Rachel One More Time! I hope I have not offended anyone, especially if you are one of the ‘special’ people who have discovered “We Are Never Full” by typing in one of the above terms. Regardless of how you arrived, thank you for stopping by! Very funny! It is interesting to find out the words people use on Google that lead them to a blog. Gee, may Rachel herself has come to your blog. I understand that the famous folk like to Google their name. I love checking out search engine terms that lead readers to my blog. Every so often I dig into my stats and highlight some of the more strange search terms that people reach my blog through. Tons of fun, though I’ve had some hum dingers ever since it opened in August. Oddly enough nothing strange has come up regarding the Rachael Ray Makes Me Hate Her post I made. Yet. I fully expect the perves to come running any minute. 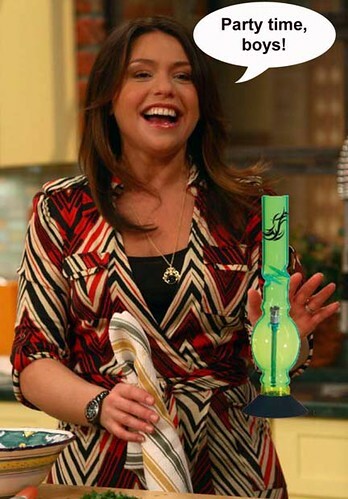 so distressing was it for me to look at that picture of rachel ray face-on, that i had to stare at the bong in her hand. when that got too much I glanced at her other hand. has anyone else noticed that she’s wearing a dude’s watch? and not just any old man’s watch, but a great big, ugly black one with a bezel (sp?) on it! it’s probably her “sweetie’s”!! top that off with the sickening contrast of stripes presented by the dish towel and her outfit, and i’m ready to yack. there really are people in this world who like her, huh? i will never get it. Pingback: We Are Never Full » Blog Archive » Rachel Ray – Maybe Hate is a Strong Word? Back in 1993, as an Army medic, I was lucky(?) enough to be part of the force that re-instated Aristide back into power in Haiti. Recently watching Anthony Bourdain on the Travel Channel (why is one of the best food shows on the Travel Channel?) I caught the episode where he visited Haiti after the earthquake. I was surprised and even shocked when he got the same exact foods from the same roadside area that I enjoyed eating from back in ’93. A search for piklis recipes brought me here, and happily found a griyo recipe as well. The piklis is now pickling and I’m now enjoying browsing your blog and recommending it to others.